To get started on booking your Fall or Winter Mini Session, please fill out the form below and Juli will email you back within 24 hours. Booking requests will be responded to in a first come, first served basis and times will be reserved in the order that the retainer deposit was received. Mini Sessions require a $50 booking retainer to reserve your spot - this deposit is non-refundable unless your space is able to be filled. Remaining balance must be received 1 day prior to session date. Questions? See the Mini Session FAQ's below the form. Why should I book a mini session? Mini sessions are an affordable, fast & super fun way to get great professional images without sacrificing quality or creativity, and without investing a significant amount of time or money. Whether you book a session every now & then or several times a year, you’ll always have the opportunity for fresh, beautiful, affordable photos whenever you want them. Can I use a mini session to get a family portrait? Absolutely. Mini Sessions are a perfect way to quickly update your family portrait and update photos of your children. 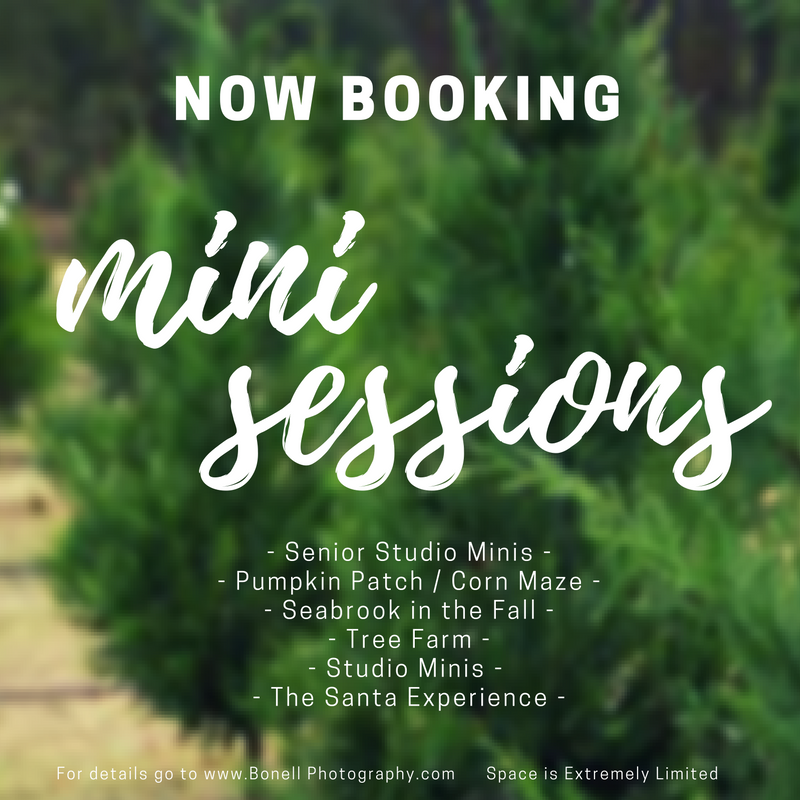 Sessions are available for couples, families or just children. How long will a mini session last? Your mini session will last about 20 minutes depending on your package. Typically between 5-8 sessions will be scheduled back-to-back, depending on the time of year. Because these sessions are scheduled back to back, it is extremely important you arrive at least ten minutes before your scheduled time. If you are late to your session, it will be cut short to not cut into the next family’s session. How many photos do I get from my mini session? You will receive at least 15 edited images in a private online gallery from your mini session. Please refer to the specific package for all the details on your mini session. If it rains, or we have bad weather, I will make the call to reschedule the mini session no later than 10am the day of the session. We will likely still have the session if it is cold outside, but if it’s terribly windy, or raining, it is likely we will need to reschedule. I will contact you via the email address you provide, to inform you of the necessary reschedule, and the date. If we have to reschedule the session, I will do my best to reschedule them as soon as possible. Can we bring any outfit changes for our mini session? Because the mini sessions are less than 30 minutes each, we want to be shooting the entire time. Therefore, only one outfit will be allowed during mini sessions. Please come dressed in that outfit and ready to have some fun! If you want to change things up, dress in layers: a jacket, scarf or sweater that can be simply removed, works well for this. But keep it simple. Adjustments will cut into your session time. You are welcome to bring a few props, if desired. Personalized signs, pre-written chalk boards, a special book, or other meaningful items are always a great idea! But I would recommend limiting it to three items as again, this will cut into your session time. Due to the shortened timeframe, pets are not recommended, but also not refused either. I know furry family members are super important to many of us, but for mini sessions. time is limited and we want to make sure we get as many photos as possible in the time you have reserved. So please keep in mind that bringing your pet may impact the number of images in your gallery. How many different posing/setting options will we have? I try to always select locations that offer different setting options. During each session, I will guide clients into multiple settings, and natural interactions. We will move around for variety in photos as much as we can, and I do my best to offer you as many options as possible, but my primary focus will be in capturing true personality & interactions in your images. Can I request a specific photo? Mini Sessions do not allow the same flexibility as a full session & as with all our photography sessions, no shot is guaranteed because there are too many factors to consider. How long until I receive the photos from my mini session? I will send you 2 emails roughly 2 weeks after your mini session. One will give you the details depending on your chosen package, and the other will be your "private invitation" to set up your personal password to access your online gallery of completed images. I do everything in my power to finish editing photos as soon as possible, however some sessions do tend to have longer wait times due to being during a high-demand time of the year. While all the mini session packages include a coupon code to receive 20% off you initial print order through your online gallery, a print order is not required. If you are ordering a package that includes digital images with the print release, I am happy to refer you to a consumer-level professional lab, although I am not able to guarantee print quality through outside labs for prints not ordered through Bonell Photography. *All Sales are subject to sales tax.